There are plenty of reasons to go to Scotland outside the busy tourist season. Even quieter roads, dramatic winter scenery, Christmas atmosphere in the Scottish Cities and the possibility to see the Northern Lights are just a few reasons to visit Scotland this winter. If you decide to make the journey you’re likely to add cheaper accommodation to that list as well. For the price of one week in the summer you can get 10 days or sometimes even two weeks in the winter! Of course you don’t get the long summer nights with endless light but you will get a cheaper and just as pleasant holiday. If you can’t, or don’t want to visit Scotland this winter, but you still want to save money and get great discounts, now is a good time to start thinking about your next Scotland Holiday. Booking early can save you a good deal of money. For instance, Ferry companies who operate the North Sea between Netherlands and the UK can give great early booking discounts. I myself saved over £250 on a return ferry crossing with cabin for the summer of 2018 from Hull to Rotterdam which I booked last week. Flights can also be considerably cheaper when booked well in advance. For more info on ferries and flights please visit our travel pages. One thing on my list for next year is a motorhome trip to the far north of Scotland, including Orkney. Although I don’t own a motorhome I do like to be flexible and travel, or stay put, whenever I want it. 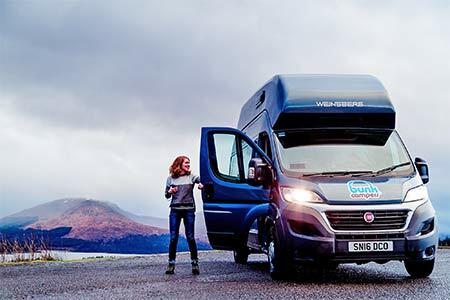 A motorhome is a fantastic way to discover Scotland. I did it the first time in the spring of 2012 when I travelled for four weeks with my family the entire west-coast of Scotland including the Outer Hebrides. It was the trip of our lifetime, something we will never forget. Nowadays motorhomes have everything you need and most campsites in Scotland are very welcoming and offer great facilities too. The disadvantage of a motorhome can be the costs if you compare it to travelling by car and a tent. That’s why it’s good to know that with companies like Bunk Campers you can save up to 20% on your hire for next year if you book before 29 December 2017. It’s going to be great next year, especially with the knowledge that 2018 will see a lot of new attractions and events all over Scotland! More about that in a later post.